Happy (almost) Thanksgiving (in the U.S.)! I want to share a recent family tradition which might help you through some of those awkward conversations with others around the table. 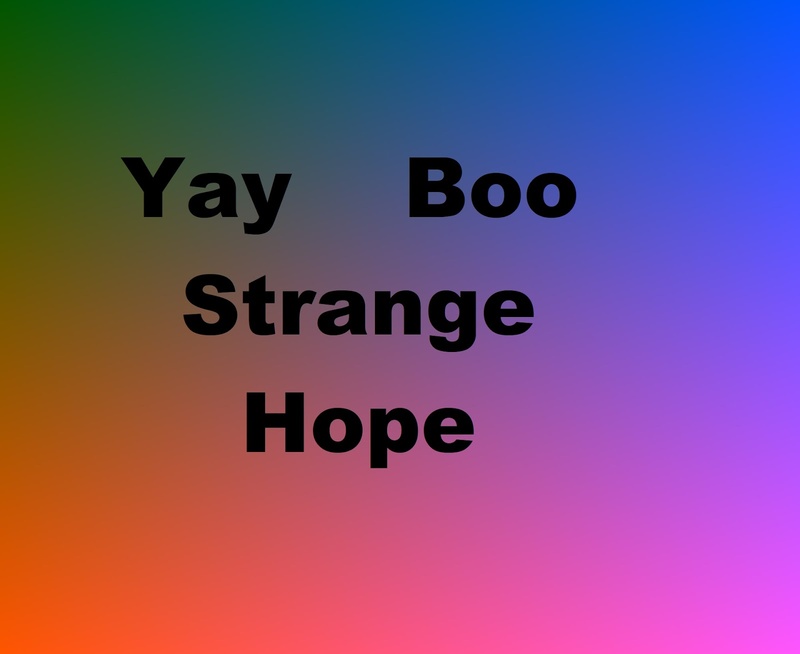 We call it Yay Boo Strange Hope. (1.) Sit in a circle (e.g., around the dinner table). (2.) Choose a topic. For example: your schoolday/workday, wilderness camping, Star Wars, the current state of academic philosophy. (3.) Arbitrarily choose someone to go first. (4.) That person says one good thing about the topic (the Yay), one bad thing (the Boo), one weird or unexpected thing (the Strange), and some wish for the future related to the topic in question (the Hope). (5.) Interruptions for clarificatory questions are encouraged. (6.) Sympathetic cheers and hisses are welcome, or brief affirmations like "that stinks" or "I agree!" But others shouldn't take the thread off in their own direction. Keep the focus on the opinions and experiences of the person whose turn it is. (7.) Repeat with the next person clockwise around the circle until everyone has had a turn. * It is modestly successful in getting even monosyllabic teenagers talking a bit. Usually they can muster at least a laconic yay boo strange and hope about their day or about a topic of interest to them. * It gives quiet people a turn at the center of the conversation, and discourages others from hijacking the thread. 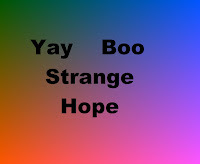 * Yay Boo Strange Hope typically solicits less predictable and more substantive responses than bland questions like, "So what happened at school today?" Typically, you'll hear about at least three different events (the Yay, Boo, and Strange) and one of those events (the Strange) is likely to be novel. * The Boo gives people an excuse to complain (which most people enjoy) and the Yay forces people to find a bright side even on a topic where their opinion is negative. * By ending on Hope, each person's turn usually concludes on an up note or a joke. When I was touring Pomona College with my son in the summer of 2016, I overhead another group's tour guide describing something like this game as a weekly ritual among her dormmates. I suspect the Pomona College version differs somewhat from my family's version, since I only partly overheard and our practice has evolved over time. If you know variations of this game, I'd be interested to hear from you in the comments. Yay! I plan to try this. Lets try it at dinner.